Other names: Himalayan mulberry-2, kimu. 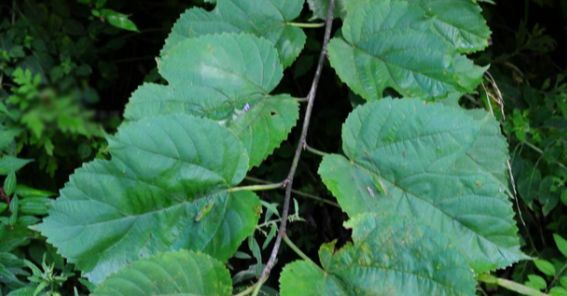 Chimmu is a common mulberry of the Western Himalayas. It is found trans Indus to Kumaon, principally in the inner ranges of Himalayas at altitudes of 1200-2700 m.
Chimmu is frequently cultivated in the hill stations and sometimes also planted as a shade tree. A large tree, 18-21 m high, with a clean cylindrical bole 3.5 mm long; bark reddish or greyish, brown, smooth when young, rough with vertical fissures in old trees. Leaves broadly ovate-cordate, acuminate and often lobed. Flowers dioecious in spikes; male spikes, 2.5-5.0 cm long, female spikes shorter. Fruit long, purple, sweet, edible. Fruits are sweet and tasty. These are fondly eaten and sometimes are also offered for sale in hill towns. Chimmu tree is lopped for fodder. Leaves are also used for feeding silkworms by villagers engaged in home scale sericulture. The tree yields a tough timber. The wood is also used for furniture. It is also very suitable for carving. It is also used to make toys, troughs and butts for guns. 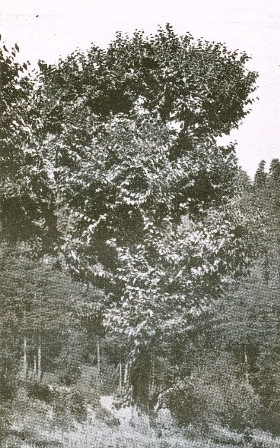 Chimmu trees are often planted in the hills for various uses. New plats can be raised by from seed as well as from cuttings.